I couldn’t figure out what to do with this, but I knew I wanted to do something with this, so this is what I’m doing with this. I made a chart and now you’re going to look at it. When Dustin Ackley was demoted to Tacoma, it wasn’t about Ackley’s swing being completely off. It wasn’t that the Mariners were displeased by his ability. It was more about Ackley’s approach, with the team suggesting he wasn’t being aggressive enough, and with Ackley admitting sometimes he let himself get too passive. The Mariners, and Ackley, wanted him to get back to being “ready to hit,” whatever that means. It was a psychological thing, and that was Ackley’s mission in Triple-A. Instead of waiting around, Ackley had to adjust to get to going on the attack. There’s evidence to suggest Ackley is indeed a little more aggressive now than he used to be. But this isn’t unprecedented — his Z-Swing% has reached the 60s over stretches before. When he was initially extremely successful, his Z-Swing% hovered around the low 50s. What’s clear is that Ackley hasn’t completely changed his approach, nor was that the goal. This is just something to monitor going forward, as it follows that “being ready to hit” should show up in higher swing rates. Alternatively, it might be about swinging at the same pitches, but just being more ready for them, in which case all we can really do is examine the results. Since being recalled, Ackley’s hit .240 with a .613 OPS and zero home runs. Sometimes he’s looked real good, but Felix Hernandez has hit a grand slam. So, yeah. Take this for whatever it’s worth. Those are Dustin Ackley’s swing rates over time. If you don’t think this was worth posting, don’t blame me. Blame my parents, without whom this post wouldn’t exist. Great job, Mr. and Mrs. Sullivan. I thought I noticed Ackley being less willing to take a walk since coming up. If that’s true, well, he’s following orders, right? How’s he doing in laying off the outside strike (i.e., not doing it)? Ackley still is doing an awful job of hitting (sigh). But Wedge has been silent about criticizing him, so maybe Ackley’s trying (in Wedge’s eyes). Dustin Ackley wants to be successful. The kid has been big news wherever he has been and I’m sure he is embarrassed/frustrated and a bit anxious. He is not Jacoby Ellsbury and likely never will be. He may never be an All-Star. I do think he has value and will get better. But, he has had to change his approach as pitching staffs have adjusted to his zones. He obviously has not adjusted well or quickly enough to keep up with expectations. He is still a work in progress and I hope he succeeds. Ugh, Dustin Ackley. I can’t watch him anymore. The sooner we can send him back to Tacoma, the better off we fans and our aching eyeballs will be. In Tacoma, Ackley is a stud! It’s good to be successful. Nothing wrong with owning AAA if you like to play baseball. Own it long enough, and you can try it up here again someday. 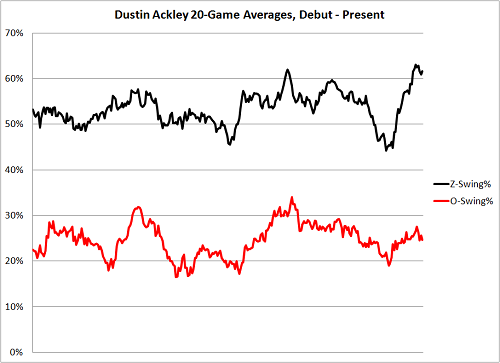 At some point, I don’t know when, Ackley became the promising prospect who is always trying to figure it out. He’s static while the baseball world keeps turning. And then I don’t want to imagine what happens if Ackley or Saunders aren’t out there. Todays fun fact: Kyle Seager is 8th among position players in fWAR. Seriously: I haven’t watched the games lately (moved, no tv, haven’t got time to go to bar). Everybody got on Ackley for laying off the outside strike, despite the umpires’ consistently calling it a strike. Has he been better about that? Nope. I don’t know, maybe the numbers would tell a different story, but pitchers are still attacking him the same way: hard outside until two strikes, then in-out, hard-soft. Josh Donaldson credited his early season success on cutting the plate in half – choosing outside or inside until he had 2 strikes based on the pitcher and how he anticipated on being attacked. Seems like a good plan for a guy like Ackley who knows exactly how he is going to be attacked. Inch a bit closer to the plate and hammer those outside fastballs until pitchers adjust. One thing that would help me here is if there was a third graph which was % of pitches in zone. Ackley has been better about not taking the pitch on the outside “corner” with two strikes. He doesn’t always put it in play but I have seen him at least attempt to put it in play and he has gotten a few hits and other times actually hit the ball hard. At this point, after watching the last two games, Ackley just needs to be patient. He has crushed the ball in two at bats and either the ball was hit right at the defensive player or that player made a great play. All you can ask of a player is to hit the ball hard and in play, which Ackley is doing more of. The hits and extra base hits should start coming in bunches if he continues to progress. I would like to take this moment to request that you tone down the “apologetic writing” that sometimes creeps into your well written articles. Your articles are fun and informed and important to we who read this site. So often though your articles will include reasons not to read them or disclaimers that the content is irrelevant to which I always disagree. I don’t imagine confidence is an issue, stop telling us it is and own your smart, funny writing! Ackley has shown a much better ability to take that outside pitch to left with authority since his return from T- town. They haven’t all dropped for base hits but it shows what he worked on. Ackley will be a fixture in the M’s line up in their successful future.